Blue Gum place is a quite residential cul de sac just around the corner from QE 2 Park. This area of East Christchurch is made up of unstable sandy gravelly soils with a very high ground water level. The client wanted no vibration which may have damaged adjacent houses. And, the narrow street had to be kept open requiring the operation to be confined to the grass verge immediately adjacent to property boundaries. The contractor, Fulton Hogan, approached TSNZ to enquire about the possibility of a solution which could accommodate the client needs. TSNZ responded with a design and supply solution using double corner slide rail for the deeper pump station and a combinatio pit using single corner slide rail and single parallel slide rail for the adjacent valve chamber. To satisfy FH and client requirements TSNZ was able to provide a full Temporary Works Design, including calculations, plus installation and extraction drawings. The design was based on soil parameters at the site including soil density, cohesiveness, friction angle and ground water level. After installing de-watering spears and drawing down the GWL, FH commenced the slide rail installation. The double corner slide rails are the latest development from our suppliers, LTW, in Germany. They have greater strength than previous models plus they incorporate anti-rotation devices to make the installation much easier. 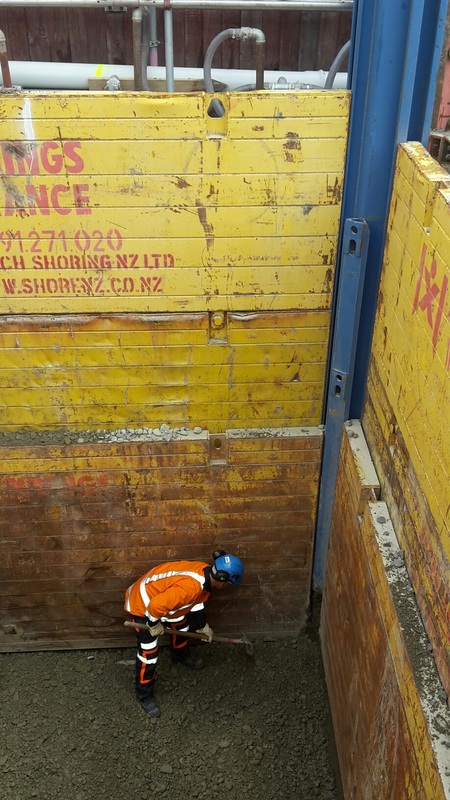 An additional safety factor was achieved by the supply of TSNZ's Edgesafe barriers around the pit. These barriers are design, constructed and tested to comply with all known standards. They are designed to attach directly to slide rail or trench box panels.